Everyone’s favorite killer doll returns for the fourth installment of the highly successful Child’s Play horror series. 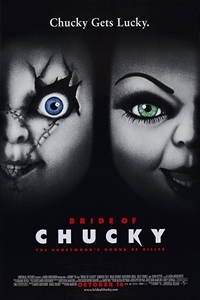 In Bride Of Chucky, the tiny terror decimated in the previous installment, is reunited with the former love of his human life, who rescues his bagged remains from a police evidence lock-up and patches him together, with the help of some heavy-duty thread and a box full of old doll parts. When Chucky demonstrates his gratitude by killing her, her soul also gets transplanted, transforming a lovely little doll in a white wedding dress into a pint-sized, homicidal harlot.